One of the territories of Arctic Canada, the Northwest Territories (NWT; French, les Territoires du Nord-Ouest) has a landmass of 1,171,918 square kilometers and a population of 42,944 as of January 1, 2005. Its capital has been Yellowknife since 1967. 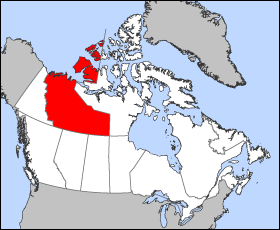 The Northwest Territories are located east of Yukon, west of Nunavut, and north of British Columbia, Alberta, and Saskatchewan. Geographical features include the vast Great Bear and Great Slave Lakes, as well as the immense Mackenzie River and the canyons of the Nahanni River, a national park and UNESCO World Heritage Site. In the Arctic Archipelago, the Northwest Territories includes Banks Island, Parry Peninsula, Prince Patrick Island, and parts of Victoria Island and Melville Island. The highest point is Mount Nirvana near the border with Yukon at elevation 2773 m (9098 ft). in debates and proceedings of the legislature. French was made an official language in 1877 by the appointed government. After lengthy and bitter debate resulting from a speech from the throne in 1888 by Lt. Governor Joseph Royal. The members voted on more than one occasion to nullify and make English the only language used in the assembly. After some conflict with Ottawa and a decisive vote on January 19, 1892, the issue was put to rest as an English-only territory. In the early 1980's, the government of the Northwest Territories was again under pressure by the federal government to reintroduce French as an official language. After some native members walked out of the assembly in protest for not being able to speak their own language. The executive council appointed a special committee of MLA's to study the matter. They decided that if French was to be an official language, then so must the other languages in the Territories. The Northwest Territories were created in 1870, when the Hudson's Bay Company transferred Rupert's Land and the North-Western Territory to the government of Canada. These formed the Northwest Territories. This immense region comprised all of modern Canada except British Columbia, the coast of the Great Lakes, the Saint Lawrence River valley and the southern third of Quebec, the Maritimes, Newfoundland, and the Labrador coast. It also excluded the Arctic Islands except the southern half of Baffin Island; these remained under direct British rule until 1880. After the transfer, the Territories were gradually whittled away. The province of Manitoba was created in 1870, a tiny square around Winnipeg, and then enlarged in 1881 to a square region composing the modern province's south. Keewatin would be returned to the NWT in 1905. In the meantime, Ontario was enlarged northwestward in 1882. Quebec was also extended, in 1898, and Yukon was made a separate territory in the same year to deal with the Klondike Gold Rush, and remove the NWT government from administering the sudden boom of population, economic activity and influx of non-Canadians. Alberta and Saskatchewan were created in 1905, and Manitoba, Ontario, and Quebec acquired the last of their modern territories from the NWT in 1912. This left only the districts of Mackenzie, Franklin (which absorbed the remnants of Ungava in 1920), and Keewatin. However, in 1925 the boundaries of the NWT were extended all the way to the North Pole on the sector principle, vastly expanding its territory onto the northern ice cap. In 1912 the Government of Canada dropped the hyphen in the North-West Territories name to Northwest Territories. Between 1925 and 1999, the Northwest Territories measured 3 439 296 km² - larger than India. Finally, on April 1, 1999, the eastern three-fifths of the Northwest Territories (including all of Keewatin district and much of Mackenzie and Franklin) became a separate territory called Nunavut. There was some discussion of changing the name of the Northwest Territories after the separation of Nunavut, possibly to a term from an Aboriginal language. One proposal is "Denendeh" ("our land" in Dene). The idea is favoured by former premier Stephen Kakfwi among others, but a poll conducted prior to division showed strong support for retaining the name "Northwest Territories". This name arguably became more appropriate following division, than it was when the territory extended far into Canada's northeast. The territory enjoys vast geological resources including diamonds, gold, and natural gas. In particular, NWT diamonds are touted as an ethical alternative that allays risks of supporting conflicts by purchasing blood diamonds. However, their exploitation has raised environmental concerns, not least the potential havoc that a spill from tailings ponds would cause to unspoiled wilderness areas such as the Nahanni National Park Reserve, a UNESCO World Heritage Site. As a territory, the Northwest Territories has fewer rights than the provinces do. During his term, Premier Kakfwi pushed to have the federal government accord more rights to the territory, including having a greater share of the returns from the territory's natural resources go to the territory. Devolution of powers to the territory was an issue in the Northwest Territories general election, 2003, and has been ever since the territory began electing members in 1881. The Commissioner of the NWT is the chief executive and is appointed by the federal Minister of Indian Affairs and Northern Development. The position used to be more administrative and governmental but with the devolution of more and more powers to the elected assembly since 1967 the position has become symbolic. Since 1985 the Commissioner no longer chairs meetings of the Executive Council (or cabinet) and the federal government has instructed commissioners to behave like a provincial lieutenant-governor. Unlike lieutenant-governors, the commissioner is not a formal representative of the Queen of Canada. Unlike provincial governments, the Government of the Northwest Territories does not have political parties, except for the period between 1898 and 1905. It is a consensus government called the Legislative Assembly. This group is composed of one democratically elected member from each of the nineteen constituencies. After each general election, the new parliament elects a premier and speaker by secret ballot. Seven MLAs are also chosen as cabinet ministers, with the remainder forming the opposition. The territory's most recent general election was on November 24, 2003. The head of state for the territories is a Commissioner appointed by the federal government. The Commissioner had full governmental powers until 1980 when the territories were given greater self government. The legislature then began electing a cabinet and Head of Government later known as the Premier. The Premier of the Northwest Territories is Joe Handley. The member of Parliament for the Western Arctic, the riding that comprises the Northwest Territories, is Ethel Blondin-Andrew. Aboriginal issues in the NWT include the fate of the Dene who, in the 1940s, were employed to carry radioactive uranium ore from the mines on Great Bear Lake. Their cancer rates skyrocketed due to lack of safety procedures that were available to their white colleagues. Another issue is historic racial tension based on the bloody history between the Dene and the Inuit, who nevertheless have taken recent steps towards reconciliation. Land claims in the NWT culminated with the creation of the Inuit homeland of Nunavut, the result of the largest land claim in Canadian history. Another land claims agreement with the Dogrib nation created a region within the NWT called Tli Cho, between Great Bear and Great Slave Lakes, which will give the Dogrib their own legislative bodies, taxes, resource royalties, and other affairs, though the NWT will still maintain control over such areas as health and education. This area includes the only diamond mines in Canada.